Hi everyone can you believe here it is the end of August. September the Seductress will soon be arriving. Most likely with an Indian Summer that fools us into not remembering that colder weather and shorter days is in the offing. Here is my take on the sketch. I ended up having to trim my ribbon as it caught and frayed when I ran it through my Creative Station. ( I know I could have just cut another piece of ribbon but how frugal is that. ;-) ) Note to self do not run ribbon through the Creative Station. I'm in the mood for Autumn so I used more autumn colors. Colors I usually don't use. Have to step outside of your comfort zone once in awhile. Without further ado here is my take on the sketch. I started out by using the other half of card stock used for a previous card for my card base. Then I added a background of the paper I created using a dryer sheet, acrylic floor wax, and wax paper. I used Brusho color crystals to color my dryer sheet and crumpled wax paper to give the texture. The technique is in the video further down in this post if you are interested in seeing how it is done. It is about a ten minute video. On top of that is a scrap of white card stock which I used Mandarin Orange and Scattered Straw distress inks to color. Then ran it through my eBosser using CuddleBug Paisley embossing folder. I don't know if this embossing folder is still available. On top of that is orange grosgrain ribbon from my stash. A Dollar Tree find years ago and alas it hardly gets used. My circles are cut out of paper I created from wax paper, paper towel , and acrylic floor wax. Here again Brusho Color Crystals were used for the colors. I'm a loving how the colour crystals reacted on the paper towel when floor wax was daubed on it. The flower is a Verve stamp from the Happy Place collection. I stamped using embossing ink and then brushed Perfect Pearl over. Then highlighted with green Stickles. When the Stickles was dry I cut out by hand and pop dotted it on top of the circle. For those who are interested here is the video of how I made the papers I used. The wax paper paper towel or facial tissue technique has been around for a few decades. I only substituted floor wax since I have some and don't do floors and using Brusho Colour Crystals instead of food coloring or color mists. Feel free to leave me feedback as I'm always interested in what my readers think. Also thank you for stopping by. Wishing you Happy Frugal Crafting till we meet again! Hi everyone I don't know about you but I'm ready for Autumn and cooler weather. 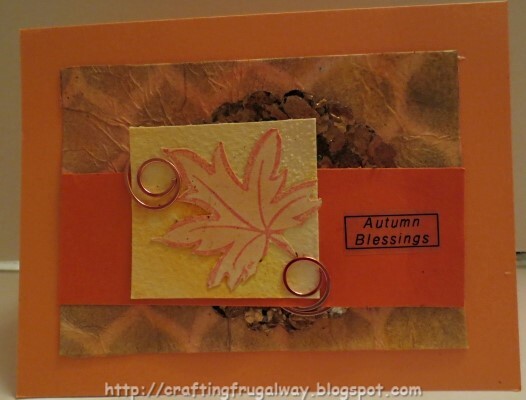 I decided to make an Autumn card. Here is the Mojo Monday sketch. The background I made using tissue wrapping paper. I colored the tissue wrapping paper with my air brush and Spectrum Noir markers. Then I took a stencil and used a Sharpie. The circle I covered with mica fragments. The narrow band is from a scrap. The yellow piece is a scrap of water color paper which I brushed water color paint on and then sprinkled coarse sea salt which I had ground up in a coffee grinder.. The salt did not totally dissolve and left a nice texture. The leaf was a leftover from a previous project and although it was a little different shape and size I used Brilliance red gold ink with Hero Arts Bold Maple stamp. I then did a little bit of hand trimming. After adhering the leaf to the panel I used circle paperclips to attach the panel to the orange strip. I have these in both copper and in colors. It is fun to once in awhile use paperclips. The phrase was printed with my Brother's label maker. There you have it my Mojo Monday card and the paperclip challenge. Do you ever use paperclips in your projects? Weather has cooled down to the 90's but by Saturday is suppose to cool down to the 70's. Yipee! My poor boys have missed our long walks. Even in the evenings it has been late before it has cooled down. Today was the beginning of Stampotique's new challenge. The theme is my favorite as it is anything goes. You can check it out by clicking on the button on the left hand side. That's all for now folks. Wishing you Happy Frugal Crafting till we meet again. Hi everyone I would have posted this sooner but I was working on a video. I promise this video is shorter than the previous one. I'm still trying to get a better set up and in fact the way I had my laptop setup it recorded upside down. Don't worry you won't have to stand on your head to watch it as I rotated the film right side up in my software program. I'm not sure what the background noise is unless it was because of the way I had my laptop setup. Sorry about that. Lol! I notice I have ink on my hands but what can I say I'm a crafter and that happens sometimes. While talking about video making I have a few questions. First off do you find background music distracting in how to videos? My second question is what are your pet peeves when it comes to videos. Mine is not being able to hear the dialogue as well as not being able to see the process because the person is working outside the viewing frame. Would you prefer there is no dialogue and you just watch the process? Before I show you the birthday card I made I have some exciting news. I found out Friday that I was chosen for a design team. I think the announcement will be made tomorrow on the blog. After the announcement is made I'll be able to tell you the company. I will tell you it is for a stamping company and when I was purging stamps I realized that I had been using some of their stamps since 1994. I'm bad as the mat is Crayola Reversible Construction paper which was given to me as a gift and until today I've only used one sheet of it. I wanted to mat my faux silk piece but couldn't find anything I liked until I saw the pad of construction paper. I decided to use my rounder punch for the corners like I did for the card base. I used my eBrush to airbrush white wrapping tissue paper. Then stamped my butterflies. Alas I don't remember which company made the stamp set but it comes with the sentiment. I made sure that the piece of wrapping paper was large enough to fold the ends under. I think it gives it a more finished look. After I adhered the wrapping tissue paper to a scrap piece of card stock I rounded the corners. The sentiment is stamped with the same Azure StazOn ink on the piece of non stick parchment I had on my workspace. Then I tore around it free hand. In the video it shows me adding glitter before adhering the wrapping paper but the glitter did not show through. Perhaps if I would have used more of a colored glitter it would have. I did go ahead and with a sponge brush carefully daub white glue over the tissue paper and sprinkled glitter the photo doesn't show it. There you have it a birthday card for a special lady. I hope that she likes it. 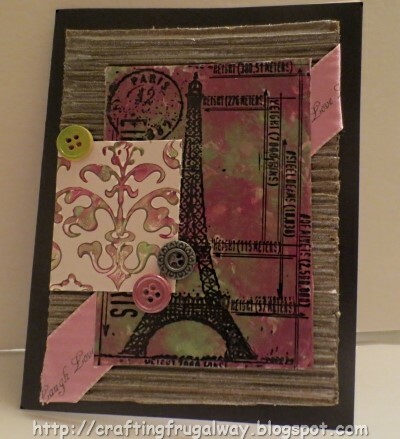 I am entering this card in the Stampotique Wednesday Challenge. The theme is Repeat. Details about the Stampotique Wednesday Challenge can be found by clicking the image on the left hand side. Here is the video I made yesterday on how to create faux silk. Time to go fix dinner. My time flies when you are having fun. ;-) Wishing you Happy Frugal Crafting till we meet again! Hi everyone this week's Simon Says Monday Challenge is Citrus With A Twist. I decided to see what I could do. I did a lot of playing and things didn't turn out the way I wanted. This is what I finally ended up with. I don't own any of the Tim Holtz Twisted Citron products so Mandarin Orange distress ink had to do. Alas my yellow ink which I was going to use disappeared. I found the lid but not the ink pad. I wonder if it accidentally got left at my son's house as the last place I was playing with the mini ink pads was there. I don't know what happened but I scored wrong for folding my card base so I used a pair of pinking shears which are so old they will no longer work to pink fabric and trimmed the edge. I played with stamping with distress paint using different stamps but finally decided to use a resist technique. I stamped with white embossing ink on a scrap of white card stock and then heat embossed with white pearl embossing powder. I used Stampendous cube leaves stamp. I don't know if it is still available as I couldn't find it online. 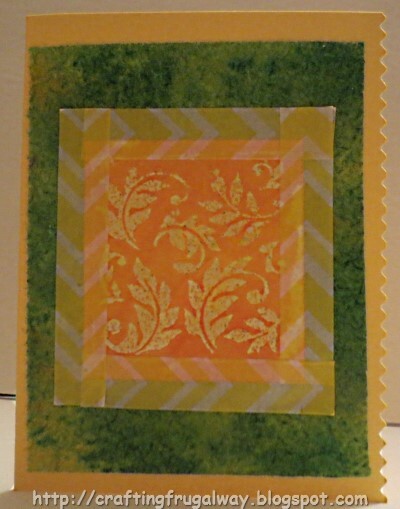 I then misted my cardstock and using a blending tool applied Mandarin Orange Distress Ink. Then sprinkled yellow Brusho Colour Crystals . When I went to wipe off specks of the crystals I noticed that it was coloring the stamped image and I liked it. I went ahead and colored the leaves more using Faber Castell yellow water color paint. I thought something was needed and remembered that I have chevron washi tape by G Studio so used that as a frame. I like how it worked out with the stamped image. While a lot of the Simon Says design team went more with a summer theme I'm ready for Autumn. I think my citrus colors work well with the leaves which have more of an autumn look to them. I hope I have inspired you to do a project using citrus colors. Especially if they are not the colors that you usually use. Hi everyone a new week and a new sketch layout over at Mojo Monday. I spent a fun afternoon yesterday playing and then today putting the card together. I also was playing with using color buttons for a personal challenge. 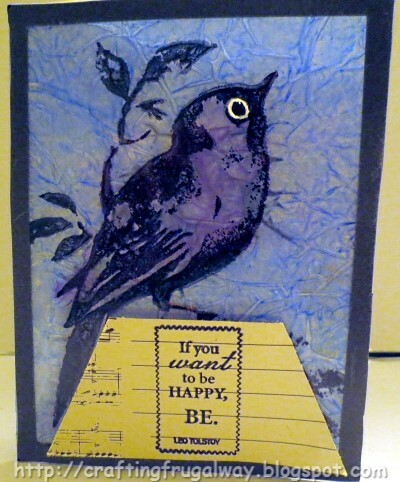 I wasn't sure exactly how I was going to do the card but wanted to use a Tim Holtz stamp image that I had stamped on acetate playing around last week. I also wanted to play with distress paint as they seem to be one of the most neglected items in my craft room. I used corrugated paper which I bought in a roll for the background. I used my eBrush with a couple of Spectrum Noir markers and a gold Sharpie. Then I brushed with a sponge iridescent paint over it. I could not get a good picture of the background without getting glare from my stamped image. :-( I stamped on acetate using a Tim Holtz stamp. Then turned it over and finger painted using distress paints. 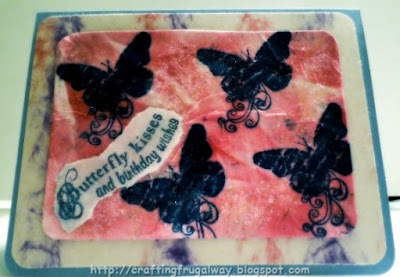 I stamped in the wet paint but because it was still wet when I added the tissue paper the stamping disappeared. Using the distress paint I did not get as opaque a look as I got previously using different mediums. I looked at my stamp and picked up a scrap of card stock and stamped on that. That is my piece on the left side. I love the result that I ended up with. I will definitely be using a piece of plastic as my palette and stamping with distress paint in the future.Since I had left over paint I did finger paint on some scrap acetate and used the stamp on that also. This time I let it dry and love the results I got so that will be used in a future project. A year long challenge group I belong to this week has the challenge of using color buttons. I have a ton of pale pink buttons which I never use. The yellow green button was actually pale pink to start out with but my eBrush air brush machine and a couple of Spectrum Noir markers changed that. The pink button also started out as pale pink but Recollection Raspberry Pearl embossing powder changed that. If you are going to be heat embossing plastic buttons be careful you don't melt the plastic. The other button came from a bag of buttons I bought at a thrift store. Alas several moves back I got rid of my button collection thinking I wouldn't be needing them as I no longer sewed. Have you ever printed on something other than paper? If you stamp what things have you used in place of ink to stamp with? Time to go fix some dinner and after eating to clean up my playroom again. I swear that when I'm away the cleaning fairy comes into the room and instead of cleaning starts playing with my things. Wishing you Happy Frugal Crafting till we meet again! Normally I use solid card bases but I've had this Recollection Frosty Cabin pack of pattern card stock for a few years now so decided to use the plaid. It reminds me of my favorite flannel nightgown. I used Silhouette cutting file Design ID #14629. for my focal shape. I cut the shape from plastic from a page protector and white card stock. I did an offset to get my frame shape. The frame is cut out of white card stock and airbrushed with a bronze Sharpie. The trees and reindeer are from Karen Foster Designs Christmas Clear Stamp Set SKU# 02233. Although the set is listed on the website I do not know where it is available unless perhaps on eBay. I love how I can combine two stamps to make my trees as the set come with a triangle stamp and a couple of different stamps of trees which are branches only. 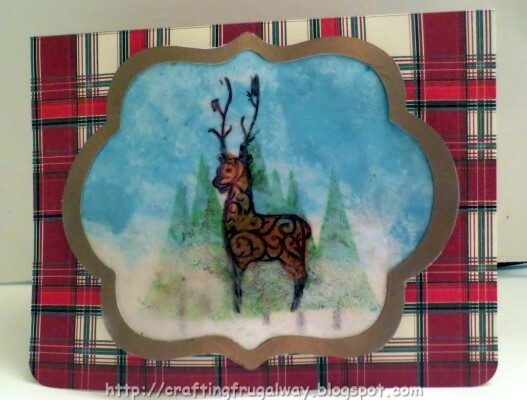 I stamped the reindeer on plastic using Stazon Timber Brown ink. The trees were stamped on white card stock using Stazon Cactus Green for the triangles and Timber Brown for the branches. I did some over-stamping of the trees. This time I mixed paint with glue on my craft mat and finger-painted on the back of the stamped plastic. I used blue Distress paint for the sky, white metallic paint for some snow and copper for the reindeer. I wish you could see the sheen from the white paint. When I was through painting I sprinkled some Martha Stewart coarse glitter over the wet paint and then placed tissue paper over like I did in the previous post. This time I did not crumple the wrapping tissue paper. before placing it in the glue mixture. Also since the paint/glue mixture was already drying I thinned some white glue with water and with a sponge brush carefully dabbed it on the wrapping tissue paper after it was pressed down into the paint. The thinned glue makes the tissue paper a little more transparent.. Then I adhered my stamped white card stock. When it was dry I adhered my frame on the front and then pop dotted the piece on my card base. Hi everyone! First of all I must apologize for how long the video is. Alas I am still trying to learn how to edit in my video program and couldn't figure out how to trim more of the video. Also trying to figure out how to use the web cam for making videos. Also I didn't realize that the flower frame was animated. Note to self do not use it next time you make a video. I forgot to mention in the video that the color mediums and tissue paper is applied on the back of the stamped acetate. I will be sharing two cards which has the technique used in the video. The first one I did the background with thinned paint. The second card is using the piece I did in the video which was cut out with a Spellbinder die later. The layout of the card is this week's Mojo Monday sketch challenge. I decided to cut a narrow frame out since I wasn't thinking about framing when I stamped on the acetate. The sentiment is stamped on a piece of notepaper I found at a thrift store. I liked the music at the one side and the bottom has a teapot which I'm sure will find its' way in another project. I don't remember who makes the sentiment stamp. 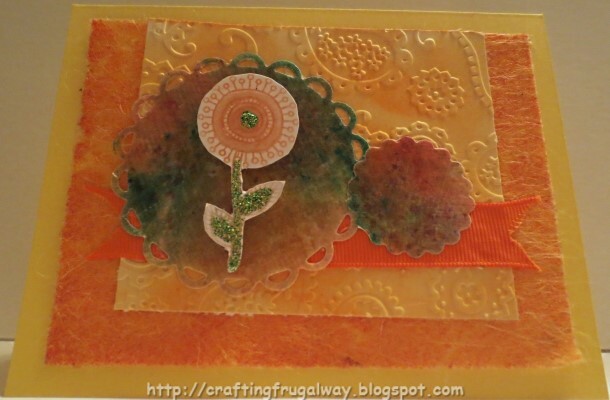 And here is my second card using the stamped flower from the video. Originally I was going to use a blue card base but after doing the background I changed my mind. In my stash of pre-made card bases I found this green one. Most of the pre-made card bases I have left are in the orange and gray families so I was surprised to find this one. The background was done with Memento Teardrop Sorbet inks stamped on plastic and which was misted with water and then my card stock smooshed around. This is actually the back side as I decided I liked it better. I didn't realize the card stock was still damp when I set it back down on the plastic after I colored the ribbon so the card stock picked up the green. 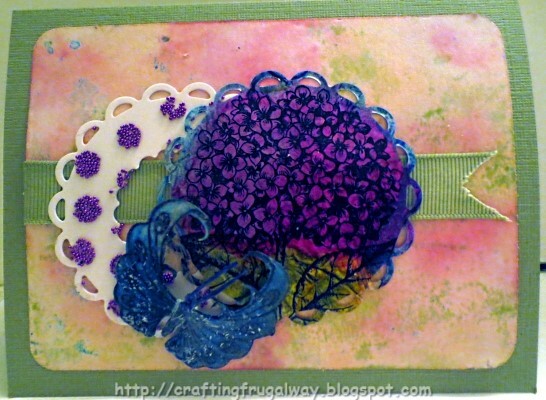 The hydrangea stamp was a few years back a monthly stamp featured at Michaels. For something like $5 I just had to have it. ;-) The video shows how this image was colored.. I used a Spellbinders die to cut it out as well as the scallop circle beside it. I love how the circle next to the stamped image turned out by using the smallest circle die to cut out the inside. I was experimenting with micro-beads and a stencil. I used rubber cement but some of the beads rubbed off. :-( Perhaps the glue for applying foil will work better. I do like the added texture and since I have a few bottles of these beads which I bought on sale I would like to find a way to use them and have them stay. I may have to buy Creative Medium as before when I was playing the beads stayed on with that. The butterfly was one I had stamped to scan into my laser printer so I could use foil. Argh! The ScanNCut cremated the antennas when it cut them out. I can't fault the machine though as my Cameo has done the same thing with butterfly images. I used scrap floss and knotted it for the head and antennas I sprinkled turquoise Brusho Colour Crystals.over the stamped image as well as some Perfect Pearls then misted it. When it was dry I heat embossed with clear embossing enamel. I had forgotten that I had accidentally put some white embossing powder in the jar so I got some white specks. The butterfly is from Verve's Happy Place stamp set. I am so in love with this butterfly. I will see if after I clean the blade for the ScanNCut if it will cut the stamped image like it should. I can see in my future a lot of fun projects besides foiling and using color crystals using this stamp. Time to go grab yourself a cup now and watch the video if you are interested in how to do the acetate and tissue technique. If not that is all right but I really would like some feedback besides making the video shorter. Lol! Temperature is back in the triple digits. :-( Good thing I took the advantage last week of cooler weather and went on adventures with my two dogs instead of doing a lot of crafting. Although I did last week do some experimenting.with Brusho Colour Crystals and stencils. Hi everyone here it is Sunday and I've spent all day playing with Brusho Color Crystals and matte photo paper. I also spent the day making a video and editing. It is not perfect by far and you will notice that I don't look like my photo. Lol! I really need to get my hair cut. Also I've been playing so much that my hair is now becoming glittered. And here you thought it was turning gray ;-). The image used for the title page and credit page is from finger painting on the matte photo paper what was on my mat when I got done playing today. You know me I'm frugal and don't like to waste anything. ;-) Also I wanted to see if it was possible. Because the matte paper is not water resistant like some glossy paper I had the liquid Brusho mixed with the coating of the photo paper. I did buy a thickening agent but have not converted to U.S. measurements so I can mix it up. Sorry about the one spot where I'm positioning the camera so you can see what I'm doing and the audio is low. What I was saying is that alas my Ranger Mister bottles have bit the dust and quit working. :-( I think although they are bigger I'll stick with the misters I find in the art section at Michaels. Not only are they cheaper but they seem to last longer. I did go overboard with the water as the photo paper in does not absorb water like watercolor paper or card stock. This is only the second video I've made so any constructive criticism is accepted. Please let me know if you found this video helpful and what you liked or didn't like about it. Thank you! Time to go brave the heat and take the dogs out for another walk. Wishing you Happy Frugal Crafting till we meet again!